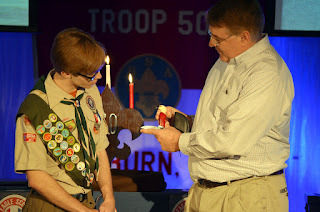 On Saturday, April 23, the troop celebrated Robert Perry's accomplishment of earning the Eagle Scout rank with an Eagle Scout Court of Honor at Auburn United Methodist Church. Robert passed his Eagle Scout board of review on September 15, 2015, making him one of three Troop 50 Scouts to earn Boy Scouting's highest rank in 2015. Senior Patrol Leader Nicky opened the court of honor, and Robert's older sister, Jessica, offered an opening prayer. Troop 50 Scouts Davis, Kyle and James Robert, all of whom have been active with Robert in Scouting since Cub Scouts — provided background on the symbolism and historical relevance of the eagle. 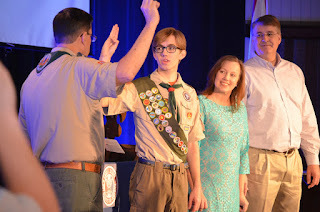 Scoutmaster Andrew Baird administers the Eagle Scout Promise to Robert as his parents look on. Scoutmaster Andrew Baird presided over the Eagle Court of Honor and recounted some stories from his experiences with Robert, which included leading Robert's 2013 Philmont expedition in addition to serving as his assistant scoutmaster, and now scoutmaster. After reciting the Eagle Scout Promise with Mr. Baird, Robert's mother, Jill Perry, pinned him with his Eagle medal. Robert in turn presented Eagle Scout mother and father pins to his parents. that belonged to Robert's grandfather. 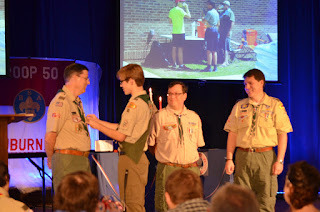 The troop formally recognized Robert's accomplishment with Troop Committee Chairman Rob Stanford's presentation of an Eagle Scout neckerchief slide, and Chartered Organization Representative Michael Tullier's presentation of membership in the National Eagle Scout Association (NESA). Robert's mother presented him with a matte to frame and display the ranks he earned through Scouting, and his father, Jim, presented him with a collectible eagle pocketknife that belonged to Robert's grandfather. Chartered Organization Representative Michael Tullier, who also served as his Eagle Scout project coach. Robert offered thanks to everyone for attending and their help and support that led to his completion of the Eagle Scout rank. 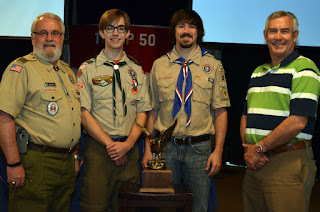 After Robert presented Eagle Scout mentor pins to Mr. Baird, Mr. Stanford, and Mr. Tullier, his brother and fellow Eagle Scout, Chris Perry (Class of 2009), closed the ceremony with a prayer. 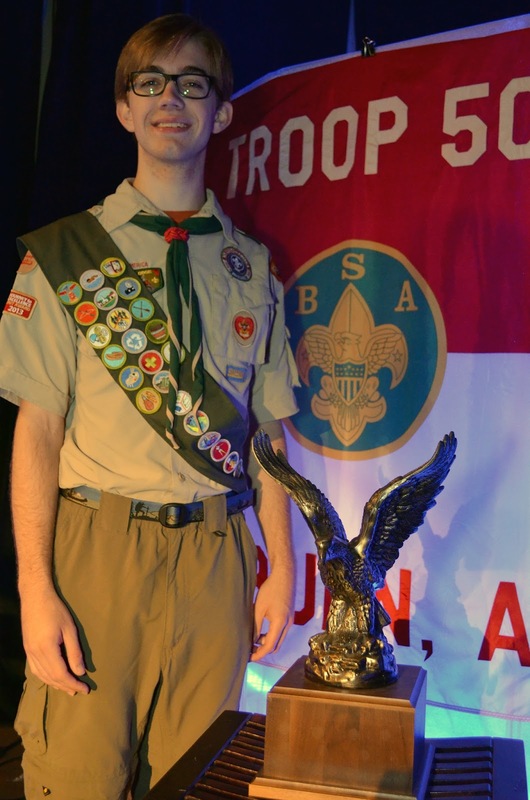 As a founding member of Troop 50, Robert served previously as assistant patrol leader, patrol leader, and troop guide. Through his Scouting participation, he earned 25 merit badges and the God and Church Protestant religious emblem, as well as accrued more than 80 nights of camping and 100 miles hiking and backpacking, which included a 12-day excursion to Philmont Scout Ranch, the BSA’s largest national high-adventure base in Cimarron, New Mexico. He became a member of the Order of the Arrow, the national Boy Scout honor society, in 2011, and in 2012 he completed the BSA’s National Youth LeadershipTraining, a six-day course equipping Scouts with leadership skills and experience applicable to both Scouting and personal situations. his brother, Chris Perry, Eagle Class of 2009; and his uncle Fred Perry, Eagle Class of 1970. 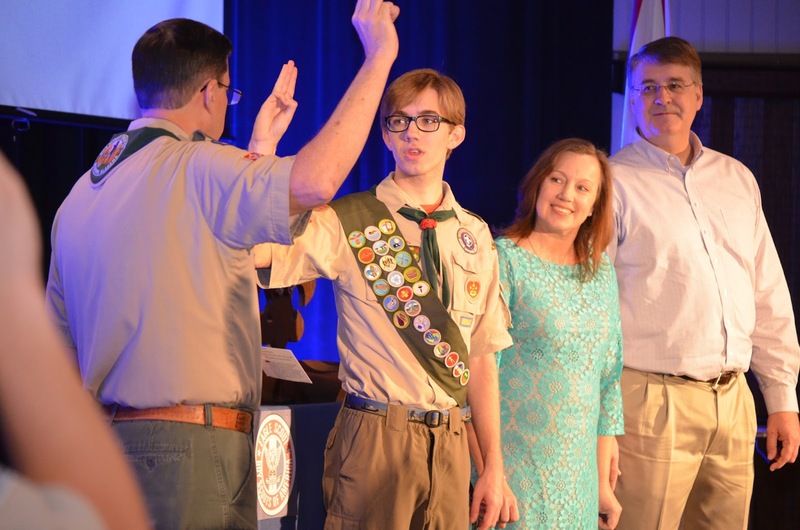 Robert also is the newest Eagle in a family that includes three other Eagle Scouts: his brother, Chris Perry of Auburn, Eagle Class of 2009; and uncles Bill Perry of Lawrenceville, Ga., Eagle Class of 1977; and Fred Perry of Lawrenceville, Ga., Eagle Class of 1970. Robert's Eagle Scout project at Pick Elementary School in full bloom. For his Eagle Scout leadership service project, Robert constructed two large raised planter boxes at Pick Elementary School, where students now enjoy a large-scale, outdoor gardening environment as part of their studies about the plant growth cycle. Perry’s project accrued 187 volunteer hours from planning to completion, including the 50 hours he personally spent planning, leading and supervising the various stages of the project. A senior at Auburn High School, Perry is a member of the National Honor Society and Anime Club, as well as an active member of Auburn United Methodist Church’s youth ministry programs, and a former soccer player who competed through Auburn Parks and Recreation and Thunder soccer programs. He is employed part time at Niffer’s Place in Auburn. After graduating from high school this May, he will attend Auburn University, where he plans to major in computer science. Since its founding in 2012, Troop 50 has guided nine young men to earning Boy Scouting’s highest award. Read more about the Boy Scouts of America's Eagle Scout Class of 2015 on Scouting magazine's "Bryan on Scouting" blog. View additional photos from Robert's Eagle Scout ceremony on the troop's online photo album.